Competitors can download TRB Tripura Admit Card 2018-2019 from 26th April 2018 to 30th April 2018. Therefore, all the applicants need to verify the registration number and password to get the www.trb.tripura.gov.in Admit Card 2018-2019. The Teacher’s Recruitment Board Tripura will release the hall ticket for the TGT, PGT positions. We have gathered the details regarding the TRB Tripura TGT, PGT Exam Pattern 2018-2019 and TRB Tripura TGT, PGT Selection Process 2018-2019. So, the competitors need to refer the whole article to get an overview of the TRB Tripura Call Letter 2018-2019. We have also gathered the Steps To Download The TRB Tripura Admit Card 2018-2019. So, the contenders after completing the application process can go through this page to know all the information. Many of the applicants are searching for the TRB Tripura Admit Card 2018-2019. So, we have provided all the details on this page for the sake of applicants. Therefore, the competitors who had submitted their application forms within time can download the TRB Tripura TGT, PGT Hall Ticket 2018-2019. Moreover, we have gathered more information in the below table. Hence, the contenders need to refer the whole article to get more clarification about the www.trb.tripura.gov.in Admit Card 2018-2019. So, the aspirants need to download the TRB Tripura Call Letter 2018-2019 before participating in the test. The Teacher’s Recruitment Board Tripura has released a notification for the TRB Tripura Recruitment 2018-2019. So, the interested applicants need to apply on or before the last date. Moreover, the TRB Tripura is ready to recruit the 4262 candidates for the TGT, PGT Vacancies. The officials will held the examination on 06th May 2018. Therefore, the applicants need to prepare well for the exam. Furthermore, we have arranged the syllabus and previous papers on our website. Thus, the candidates can check and download to start preparing for the examination. Based on the provided syllabus applicants can prepare well for the test. And, the competitors need to score the minimum qualifying marks in the exam to include in the next rounds of selection process. Furthermore, the arranged papers are in PDF format. Thus, the candidates can easily download and concentrate on their preparation. And, refer this full article to know the accurate information about the TRB Tripura Admit Card 2018-2019. Before participating in the examination, the candidates need to download the TRB Tripura Admit Card 2018-2019. And, many of the applicants are applied for the TRB Tripura notification. So, there will be a rush to get the TRB Tripura TGT, PGT Hall Ticket 2018-2019. Furthermore, after the last date, the admit card will not be available. Therefore, within the given times, the competitors need to get the www.trb.tripura.gov.in Admit Card 2018-2019. Moreover, competitors can check more details on the official website of the TRB Tripura. In addition to this, we have collected and arranged the same information on this page for the sake of applicants. Thus, click on the below link to download the TRB Tripura Admit Card 2018-2019. The examination for the TGT positions will include the Pure Science, BioScience, and Social Science sections. And, each chapter will contain different questions for different marks. Therefore, aspirants need to prepare on those topics for the test. The test for the PGT vacancies includes the Chemistry, Economics, Political Science, Mizo, kak Barak, Education, Philosophy, History, Bengali, Mathematics, Geography, Biological Science, Sanskrit, Commerce, Physics, and English. Hence, candidates can prepare on those topics for the examination. To know more information about the exam pattern visits our website. The candidates who had applied for the TRB Tripura need to attend for the written test. So, the competitors who had qualified the written examination can include in the interview process. Applicants after downloading the TRB Tripura Admit Card 2018-2019 need to crosscheck the information given on it. Furthermore, competitors need to carry the TRB Tripura TGT, PGT Hall Ticket 2018-2019 to the test center without fail. The candidates without carrying the www.trb.tripura.gov.in Admit Card 2018-2019 will not allow into the examination hall. If the competitors find any mistakes on the admit card they need to inform the officials of the TRD Tripura. And, the candidates need to carry one proof along with the TRB Tripura Call Letter 2018-2019. 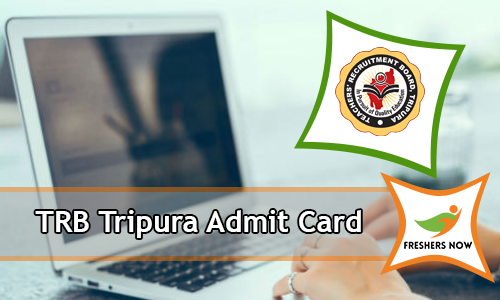 The TRB Tripura Admit Card 2018-2019 will act as an identity proof for the candidates. Moreover, at the time of examination, the officials will verify the TRB Tripura TGT, PGT Hall Ticket 2018-2019. At that time, if any misprints are found the candidates need to face issues. Therefore, before participating in the test competitors need to verify all the documents. Many of the competitors are in confusion that how to download the TRB Tripura Admit Card 2018-2019. Therefore, we have arranged the procedure to get the www.trb.tripura.gov.in Admit Card 2018-2019 in this section. Contenders can follow Freshers Now to know the latest notifications. And, we think the given article is used to download the TRB Tripura Admit Card 2018-2019.